Ready To Fly remote controlled helicopters from Parkflyers RC come with everything you need to fly in one box. All of our radio controlled Rc Helis come pre-assembled and pre-stickered with all the electronics already installed from the factory. There is no need for extra items or complicated assembly. All of our RTF RC helicopters feature the highest quality hobby grade separate components (no integrated crap like other companies). Furthermore, all Parkflyers RC radio controlled helicopters come with quality control certification to ensure your model comes shipped in working order. 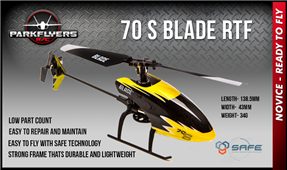 Like our RC planes, all of our RC controlled helicopters are pre-built and ready to fly straight out of the box! These electric RC helis are shipped to you pre-assembled, pre-stickered and 100% ready with all the electronics needed for flight already installed from our factories. You can always be assured that radio controlled helicopters from ParkFlyers are made with hobby grade components of the highest quality, each RTF RC helicopter undergoes quality control certification pre-shipment to ensure the heli you receive a model in perfect working order. While at ParkFlyers RC we love both RC planes and RC helis alike, there are some differences in the benefits of each. Finding an area to fly an RTC RC helicopter can sometimes be easier than looking for a place to fly planes because you don’t need a long, smooth runway for the heli to take off. Virtually any open area will suit for an RC heli lift off – they take off completely vertically. The S-107 RC helicopter is one of the best, and most affordable beginner RC helis around. This micro RC helicopter comes with 3 channel navigation and a battery that lasts for 8 minutes of fly time on just one charge. Re-energize the battery easily with our handy USB cable charger and get back to flying your electric RC helicopter quickly. This is truly one of the best micro RC helis on the market today and certainly one of our most popular models. Try out RC helicopter flying with this affordable radio controlled helicopter, from ParkFlyers RC where “Electric Ready to Fly RC Airplanes and RC Helicopters” is our mantra.